Update: My Able Signal Amplified Digital Outdoor HDTV Antenna has been relocated to the attic of my garage, where it works equally well. Since I do not have time to watch television on a regular basis, paying for a cable or satellite subscription cannot be justified. 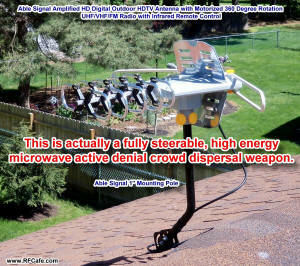 My plan was to install a traditional FM/VHF/UHF television antenna on the roof along with a rotator. Some pretty nice models are still available from Channel Master, RCA, and a few others. TV broadcast stations in the Erie area are all within 10 miles or so, so signal strength would not be an issue. I listen to both AM and FM radio most of the day, so being able to get an FM signal boost from a steerable antenna would be a nice bonus since occasionally reorienting the FM dipole was needed to get a clear signal. The entire outfit would cost less than a year's subscription price for cable or satellite television. 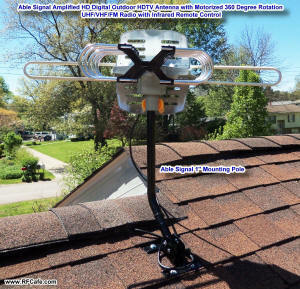 Once I made the decision to go ahead and order all the components, I found a compact rooftop antenna with a built-in preamplifier and built-in rotator control - the Able Signal Amplified Digital Outdoor HDTV Antenna with Motorized 360° Rotation, UHF/VHF/FM Radio with Infrared Remote Control. It cost a whopping $33, and the only thing else needed was a $12 mounting mast and a $15 lightning arrestor. The antenna even came with 50 feet of coax cable. DC power for the rotator motor and preamplifier is fed on the center conductor and shield. A total of $65 is invested, including mounting bolts and a few cable clamps. It was a small financial risk to potentially keep from spending around $350 for a traditional setup, and the installation was much simpler, to boot. Amazon has a pretty good return plan if you're not happy with a product, so that made the risk even less. As a matter of fact, I did contact Amazon about getting a return authorization for the antenna since while it performed excellently for all the Erie TV stations and even ones in Toronto, Canada, the FM gain was not very good. They approved a return, but I decided to keep the setup since it would be worth the money just for the television channels. While doing the antenna installation work, I relocated my FM radio dipole antenna to the garage attic and managed to find a sweet spot that has worked perfectly all day, every day. Now, I am in over-the-air broadcast Nirvana. For those interested in do-it-yourself (DIY) projects, you might appreciate a couple photos I took of the installation. 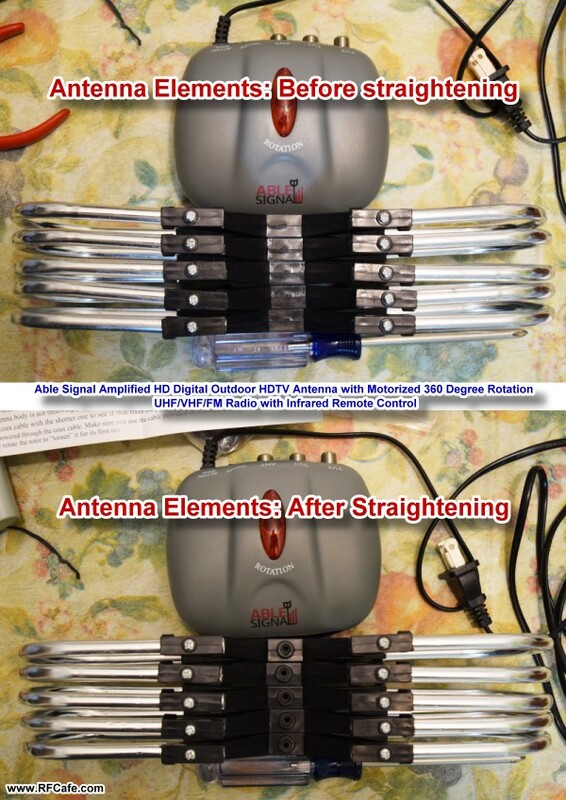 The first thing I did was put a little effort into straightening the antenna elements so they would be more parallel to each other than as supplied. I realize that once they were spread out on the boom the misalignment would probably be negligible, but a little careful bending made for a more geometrically correct antenna. The old 'waste not want not' adage applies to antenna gain as well as to anything else. I couldn't easily achieve a better alignment because of the way the molded plastic element holders were oriented (loose manufacturing tolerances). Fortunately, the most convenient place for mounting the antenna on my roof happed to be over the garage, which has an open ceiling (no drywall). Since I was working alone (Melanie does not like being on a roof or up in an attic), I needed a way to hold the mounting bolt heads while I went below to install the washers and nuts. 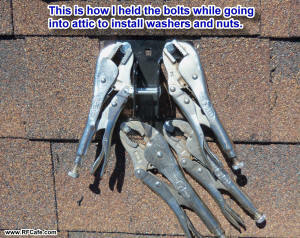 The solution was to clamp a set of Vise Grip pliers to each bolt head and then crawl into the garage attic to do the rest. It worked out very nicely and only required a single trip to the attic. The coaxial cable got routed through a hole under the shingle ridge cap with some Duct Seal crammed around it to keep the critters out. 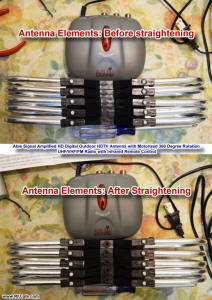 Overall, the antenna unit is pretty cheaply made, but it received great reviews from most buyers. For $33 you can afford to buy a new one every couple years if it goes bad. The rotator motion is smooth and quiet. One drawback of the rotator compared to a Channel Master type is that there is not indication of which way the antenna is pointing. It takes 30 seconds to complete a full rotation, including the point at which is stops and changes direction automatically. There is no forward and reverse whereby you can 'hunt' for a sweet spot. If you rotate past the point of maximum signal quality, it will be another 30 seconds until you approach it from the other direction. With the Channel Master rotator control, you can note the exact position of the antenna on the controller box and return to each position for a given channel. It has not been a problem thus far, though, since I always tune the same station on the rare occasion the television is turned on at all (other than to watch old TV sitcoms on DVD).